At Dalemain, ponies have been used for all purposes, from shepherding to private driving, hunting and pleasure riding. Whether they were carrying out light jobs on the estate and on the farms, snigging timber out of the woodlands, carrying red deer shot in Martindale Forest, or pulling a sled to bring hay home down the lower slopes, these tough ponies were always at hand. 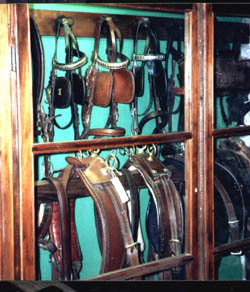 The harness cupboard contains sets of high quality brown harness for driving 2 wheeled varnished country vehicles, and fine bridles with decorated blinkers. You didn't know ponies wore boots? These (right) were strapped on to prevent the pony's hoofs damaging the grass as he pulled the lawn mower. This stirrup (left) comes from a lady's side saddle and is designed to swivel if by chance she fell from her mount. The lower arch swings back towards her foot and the tread swings down, releasing her. The leather covering on the top arch saves wear on her boot instep during normal use. 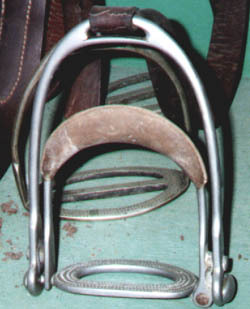 This pattern of safety stirrup is similar to that used by Cope, the sidesaddle makers. 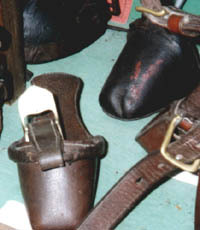 These two small stirrups (right) are referred to as "toe stirrups". They are probably older than the sidesaddle stirrup above. It would be interesting to know what kind of saddle they came from; a sidesaddle? possibly a pillion pad? If you know, please share your knowledge with us. 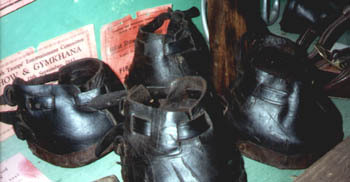 One reader says (June 2005):"about the slipper stirrup, it is indeed older than the safety stirrup. In Europe these were used on a side saddle till 1850 when they started to use the safety stirrup. Apparently they used them longer in the States. " 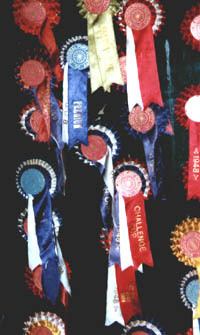 Dalemain ponies were regularly successful in the show ring and the rosette case has evidence of their wins. and at Shap on Tuesday 4 May	by Mr J Swinburn, Gowbarrow Hall, and	Mr E Handley,	Ravenstonedale. In a later edition of the Herald that month (27 March 1915) Shap Agricultural Society	reported that the Fell Pony Committee's premium	for a stallion to travel Shap	District	was	£40. The	show of stallions	was also	noted	as	taking place on	"Shap Fair	Day". Agricultural shows did continue during the War years. The reports of	Show societies discussing the issue in 1915 suggest	that it was touch and go whether they went ahead; the	main	argument for	continuing	was that farming was	essential	and it was	important to encourage	the	improvement	of stock. "Dalesman, the greatest Fell or Dales pony stallion of the last 25 years, has died. He was bred by Mr R. Bousfield of Great Asby and was owned by Mr John Relph of Newby."